Hormones released by thyroid gland play a crucial role in stimulating metabolism, growth, and calories processing. Globally, thyroid gland disorders such as hypothyroidism, hyperthyroidism, and thyroid nodules affect around 5% to 10% of the population. Hyperthyroidism and hypothyroidism affect majority of the population primarily due to growing incidence of autoimmune diseases such as Grave’s disease and Hashimoto's thyroiditis. Moreover, iodine deficiency is a widespread problem across the globe and is measured as a prime risk factor for the increase in prevalence of thyroid disorders. The global thyroid gland disorders treatment market is likely to expand at a steady pace due to the rising prevalence of both hyperthyroidism and hypothyroidism across the world. Hyperthyroidism and hypothyroidism are more common in women than in men. Furthermore, factors such as sedentary lifestyle, consistent expanding pool of geriatric population, and initiatives by the key players in thyroid gland disorders treatment market to introduce innovative therapeutic option are key factors influencing the growth of thyroid gland disorders treatment market. According to the report, the global thyroid gland disorders treatment market accounted for US$ 1,954.7 Mn in 2016 and is anticipated to reach US$ 2,609.9 Mn by 2025 at a CAGR of 3.3% from 2017 to 2025. On the basis of disorder, the thyroid gland disorders treatment market has been primarily categorized into two segments: hypothyroidism and hyperthyroidism. The hypothyroidism segment includes drugs such as Levothyroxine and Liothyronine. The hyperthyroidism segment covers drugs such as Propacil and Imidazole. The thyroid gland disorders treatment market is expanding at a moderate growth rate primarily due to rise in thyroid disorder patient population globally, rise in demand for drugs for hypothyroidism such as Euthyrox and Synthroid in developing and developed regions, and continuous efforts by leading thyroid drug manufacturers to develop advance therapeutics. However, the increased availability of several generic drugs has led to a decline in the overall market revenue. Based on geographic distribution, North America is the largest market for thyroid gland disorders treatment. According to numbers published by the U.S. Department of Health and Human Services, around 1.2% people in the U.S. suffer from hypothyroidism each year. Moreover, women are 2-10 times more susceptible than men to develop thyroid conditions. High prevalence of thyroid gland disorders, better availability of diagnosis and treatment methods, better awareness among general public, and favorable reimbursements together define the dominance of North America market. On the other hand, the Asia Pacific market is likely to register the fastest market growth in terms of sales of thyroid gland disorders drugs during the given forecast period. Countries such as India, China, and Japan together determine the market trends in Asia pacific. Large consumption of generic formulations across these countries contribute to the growth of the market, mitigating the lower sales revenue in the region. Recent growth in investments and awareness initiatives by the market incumbents also contribute to the market growth in the Asia Pacific region. Some of the leading players in the global thyroid gland disorders market are Merck KGaA, Pfizer, Inc., ALLERGAN, Takeda Pharmaceutical Company Limited, Sanofi S.A., AbbVie Inc., Lannett Company, Inc., Mylan N.V., Aspen, and Novartis AG. 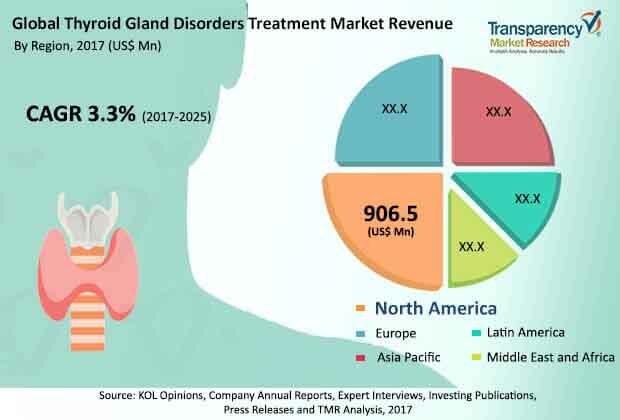 The vendor landscape of the global thyroid gland disorders treatment market is consolidated, with relatively small number of companies accounting for a majority share of the market. The thyroid gland disorders treatment market report comprises an elaborate executive summary, which includes a market snapshot that provides information about various segments of the market. It also provides information and data analysis of the global market with respect to the segments based on Disorders, and geography. A detailed qualitative analysis of drivers and restraints of the market and opportunities has been provided in the market overview section. In addition, the section comprises competitive matrix and company profiles with business overview to understand the competitive landscape in the market. This section of the report also provides market attractiveness analysis, by geography and market share analysis by key players, thus presenting a thorough analysis of the overall competitive scenario in the global thyroid gland disorders treatment market. Based on Disorders, the market has been segmented into hypothyroidism and hyperthyroidism. The disorders market segments have been analyzed based on available approved treatments for hypothyroidism and hyperthyroidism, cost-effectiveness, and preference for industries. Furthermore, Hypothyroidism is categorized into Levothyroxine and Liothyronine, where hyperthyroidism is categorized into Imidazole and Propacil. The market size and forecast for each of these segments have been provided for the period from 2015 to 2025, along with their respective CAGRs for the forecast period from 2017 to 2025, considering 2016 as the base year. Geographically, the global thyroid gland disorders treatment market has been categorized into five major regions and the key countries in the respective region: North America (the U.S., Canada), Europe (the U.K., Germany, France, Spain, Italy, and Rest of Europe), Asia Pacific (India, China, Japan, Australia & New Zealand and Rest of Asia Pacific), Latin America (Brazil, Mexico, and Rest of Latin America) and Middle East & Africa (South Africa, GCC countries, Israel, and Rest of Middle East & Africa). The market size and forecast for each of these regions and the mentioned countries have been provided for the period from 2015 to 2025, along with their respective CAGRs for the forecast period from 2017 to 2025, considering 2016 as the base year. The research study also covers the competitive scenario in these regions. The report also profiles major players in the global thyroid gland disorders treatment market based on various attributes such as company overview, financial overview, product portfolio, business strategies, and recent developments. The major players in the Thyroid Gland Disorders Treatment Market are Merck KGaA, Pfizer, Inc., Takeda Pharmaceutical Company Limited, ALLERGAN, Sanofi S.A., AbbVie Inc., Lannett Company, Inc., Aspen, Novartis AG, Mylan N.V., and Others.